川上智久, 大崎拓司. 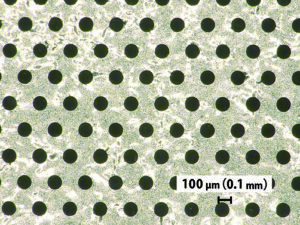 独自のメカニカル法でチタン箔に100 μm の微細孔を開孔. チタン. 2018, Vol. 66, No. 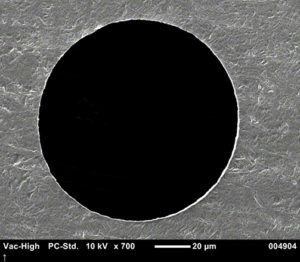 2, p. 86-87. 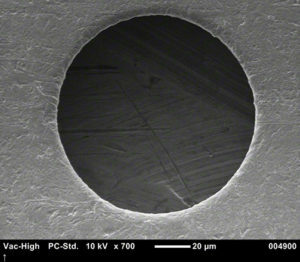 Shoyo Sangyo’s unique mechanical method enables pre-production of 100 μm diameter holes in titanium foils, a size formerly achievable only with lasers or in some cases with photo-chemical etching. 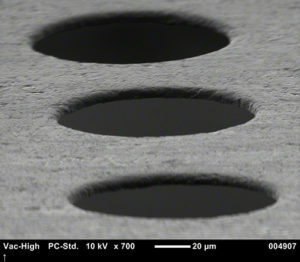 Unlike those technologies, the mechanical approach produces sharp and clear edges with negligible burr. 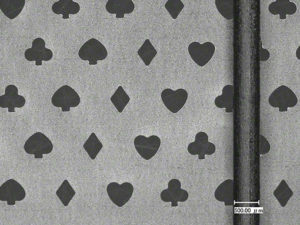 Trials consistently produce a wide range of shapes and patterns from simple 60 degrees staggered arrangement to the hearts and spades used on playing cards. Manager, Advanced Technology Development Team, R&D Department, SHOYO SANGYO CO., LTD.
Corporate Officer, Corporate Strategy Office, SHOYO SANGYO CO., LTD. Copyright © SHOYO SANGYO CO., LTD. All rights reserved.